Kenneth Faried of the Denver Nuggets may only be in his second season, but he has already started to make an impact both on and off the court and is quickly making a name for himself around the NBA. Nicknamed the “Manimal”, the New Jersey native has been making an impact since coming into the league last year. He was named to the NBA All-Rookie First Team last season, and just recently took part in the 2013 Sprite Slam Dunk Contest and the BBVA Rising Stars Challenge, in which he took home the game’s MVP Award. Currently averaging 12 points and 9 rebounds per game, Faried has been a key member of the Denver Nuggets who sit in 5th place in the Western Conference. The Nuggets have one of the best home records in the NBA, which has helped play a part in the rapid growth of Faried’s fan base. As much as he has helped the Nuggets on the court, the efforts that he continues to put forth off the court have played a huge role as well. He has helped make a difference in the Denver community and is slowly starting to make a difference across the country, and hopefully worldwide sometime soon. As a proud son of two lesbian moms, Faried stood up in January to support gay marriage equality with a PSA geared toward legislation in Colorado. As part of this, Faried has joined Athlete Ally, a non-profit organization dedicated to encouraging athletes, coaches, parents, fans and other members of the sports community to respect individuals involved in sports, regardless of perceived or actual sexual-orientation or gender identity or expression. With someone like Faried jumping on board to support this cause, it is clear that sports culture is shifting towards inclusion. “Becoming an Athlete Ally gives me the opportunity to spread a message of inclusiveness throughout the NBA and our country. I have two moms and I love them both very much. I respect, honor and support them in every way. The bond I have with them has made me realize that I want all members of the LGBT community – whether they are parents, players, coaches or fans – to feel welcome in the NBA and in all of our communities,” Faried said in a press release. As an Athlete Ally, Faired now joins Baltimore Raven and Super Bowl Champion Brendon Ayanbadejo; Chris Kluwe of the Minnesota Vikings, who was very vocal this year through blog posts, interviews and tweets; Scott Fujita of the Cleveland Browns; Connor Barwin of the Houston Texans; Australian rugby star David Pocock; Australian rules football player Brock McLean; and plenty of college athletes who have already signed on. 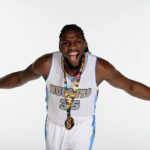 Faried will act as a liaison between the organization and the NBA, help promote Athlete Ally’s mission to end homophobia in sports by speaking out to his team, league and fan base, and encourage his colleagues to join in the effort. The announcement comes as an extension of Athlete Ally’s ongoing relationship with the NBA. In August, the organization worked in partnership with the Gay & Lesbian Alliance Against Defamation (GLAAD) to deliver a pioneering LGBT awareness training to the 2012 NBA rookies, which included a young Faried. This is definitely just the beginning, but with more and more athletes speaking up each year there is no doubt that someday in the near future all of this will be a problem of the past.